With Microsoft's hardware partners poised to unleash their Mixed Reality headsets very soon, we're not short of VR headsets to pick from right now. At the same time, however, it feels like we're having a bit of a spec plateau. Enter Pimax and its 8K headset to move things forward, pumping up the field of view and resolution to push visual immersion beyond what Oculus and Vive are offering. The Pimax headset is more sci-fi in design with a blue light running across the middle, and it's wider than the others too, like a better looking version of the Starbreeze StarVR. But hey, you're not going to see any of that when this is strapped to your face; it's what's inside that counts. First thing to know is that there are two versions here, a 5K and an 8K. Pimax has slapped on two crystal-sharp 3840 x 2160 resolution panels here (one 4K panel per eye) on the 8K, while the 5K comes with two 2560 x 1440 panels. For comparison, both the Oculus Rift and HTC Vive offer 2160 x 1200 displays, and the difference shows. Then there's that 200-degree field of view, same across both, which is significantly higher than the Oculus Rift and HTC Vive which both offer 110. Again, it's a noticeable improvement. Booting up theBlu, a passive VR experience that plunges you into the depths of the ocean, I could really appreciate that added range on the 8K headset; visually it felt a lot more natural. I'd done this experience on the HTC Vive before, but here I felt even more like I was down there with the sea life, not looking at it through a pair of ski goggles. Not having that periphery blocked made a lot of difference, and going back to using the Vive afterwards definitely felt like a step back. With that boosted resolution the individual pixels were also much harder to distinguish, thus alleviating the annoying "screen door" effect that VR headsets often have. Everything was a bit clearer, although Pimax is using an LCD screen on the 8K, and OLED on the 5K. In a game of Fruit Ninja on the 5K everything was brightly lit and colours were nice and vibrant, but in theBlu the LCD meant it was a bit darker than when I'd played it previously on the Vive. 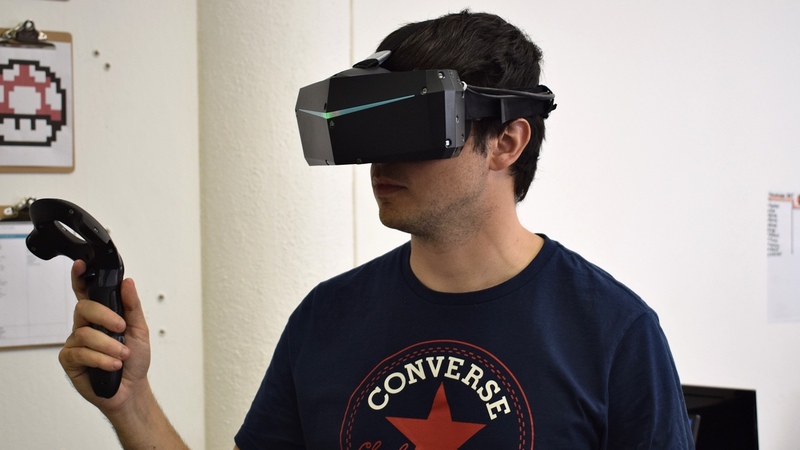 Both, however, offer full freedom of movement as Pimax works with Valve's Lighthouse trackers (so if you already own some, you'll be able to use them with the Pimax) as well as the Vive wands. Pimax is making its own version of these, which are lighter but look very similar, and will be available with the headset. It's also building a module that enables inside-out tracking, so it will be possible to walk around in the headset without the external sensors. With such meaty specs, you might be wondering what's needed to actually run this thing. My demo was running on a laptop with an Nvidia GTX 1080, but Pimax says the 8K should run fine on a GTX 980 or 1070 at minimum. Despite a lot of Ks being thrown around, what's happening in reality is that Pimax is upscaling content to 4K per eye, and for that the Pimax requires two HDMI connections, while the Oculus and Vive only need one. Pimax says it will offer native resolution support, but you're going to need at least a GTX 1080 Ti to do so. Oh, and in case you hadn't guessed, the Pimax will work with all SteamVR games. Right now Pimax's 8K headset is available on Kickstarter for $499 and the 5K at $359. If you want them bundled with controllers and laser trackers, it's $799 and $699 respectively. Pimax has already well surpassed its Kickstarter goal, but it's in the stretch goals where things could get more interesting. If it raises enough funds Pimax wants to make available an eye-tracking add-on, which you'd slot on top of the existing lenses. Eye tracking hasn't yet hit mainstream VR, though HTC has announced it's coming to the Vive via a third party. We also tried out Tobii's version, which was released as a development kit earlier this year. All of which is to say it's very promising. Visually, the Pimax surpasses everything else out there, even though it has its own limitations. It's nice that Pimax is offering two tiers of hardware, but it's the 8K that really raises the bar for VR.